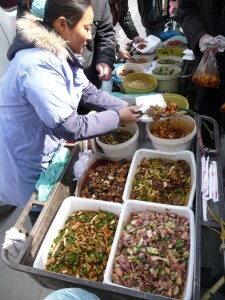 One of the things that always strikes me in China is how remarkably well so many people eat. It’s ironic that so many westerners think of Chinese food as being unhealthy – all those negative images of deep-fried food in gloopy sauces laden with MSG. Restaurant food is often richer, with more meat and fish, more oil and fewer vegetables, but home cooking tends to be centred on grains and vegetables, with small amounts of meat here and there. I have been teaching in a teacher training college here in Guangxi for 10 years. Before that I did the same in Hunan Province for two years. I am still amazed to watch students getting stuck into great piles of vegetation and rice every lunchtime. Even when they do push the boat out and have dishes containing meat, they still have to also have a plate of stir fried greens. 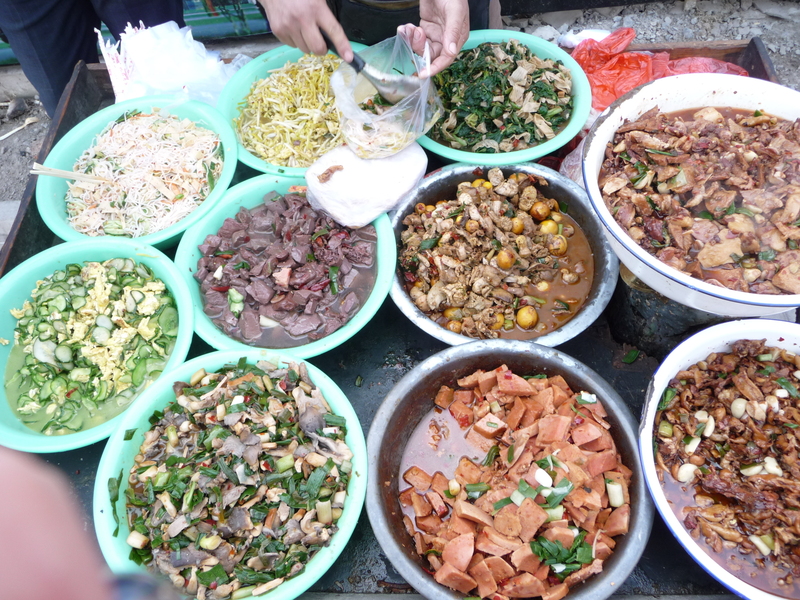 I’ve also seen little children pick the greens out of soupy noodle dishes and eat them in preference to the meat. I’ve just finished reading “Shark’s fin and Sichuan pepper”, which I enjoyed very much, but for a while there you’re pretty down on the current state of Chinese ingredients and eating habits: toxic gluttony seems a good summary. The last chapters are much more positive, and you’re very positive in this post, but I’m left a bit confused: is it all hunky dory again since you flipped out about hairy crabs and banquets? I guess it’s also a result of the western idea of one pot cooking that makes it difficult to understand what and Asian meal is like. I find myself exhaused and stretched for time if I try to make just a few dishes. Much easier to make a casarole, eh? I’m currently living here in Japan and after 7 years, I’m still amazed when I see housewives making a (what I consider) large number of these little side dishes to go with the main coarse. Which of course is very little meat. Being a fan of the foods of many Asian countries, I’m not going to give up trying to make healthier tasty food! Yours is a complicated question to answer! Firstly, as I hope I made clear in the gluttony chapter of ‘Shark’s Fin’, the culture of wasteful and excessive eating in restaurants has always been balanced by a tradition of moderate, healthy and wise home cooking. And I’ve always been impressed by my Chinese friends’ knowledge of how best to nourish their minds and bodies through the food they eat. It was these last two aspects that I was talking about it my blog post. When it comes to ingredients, the picture is less rosy, because of the awful pollution in so many areas, the rapid industrialisation of food production, and the frequent food scares. My growing awareness of all this (as documented in the book) coincided with a period of great weariness with China in general, which is why it affected me so deeply. Now I’m very much enjoying China and my research again, but I’m still worried about certain types of food. Broadly speaking, I’ll taste almost anything for research purposes, but I try to avoid eating too much seafood and river-food (there have been so many scares about the use of illegal drugs in fish farming, and there are high levels of pollution in many kinds of fish anyway), I don’t eat large quantities of meat (risk of hormones), and I prefer a diet dominated by rice or noodles and vegetables. This seems to me to be a good compromise. And of course there are sound environmental reasons for eating less meat and fish too. Thanks for taking the time to answer. I’m certainly drifting back to a largely vegetable diet (and growing my own) and after trying (and enjoying) the meat versions of your recipes I’m trying to recreate vegetarian versions keeping the flavours and textures. Although not, perhaps, that of duck’s feet and sea cucumber (sorry, getting old). I hope that the pollution becomes a priority for the Chinese government: they owe it to their people and their culture. Hi all, I have eaten meals at building constructions camp sites in places like Nanjing, Beijing and Luoyang although I can afford to eat at five star restaurants every day. The food was always tasty, fresh and wholesome home style cooking which never got dull. Never got sick from it and the prices were a pittance for westerners. 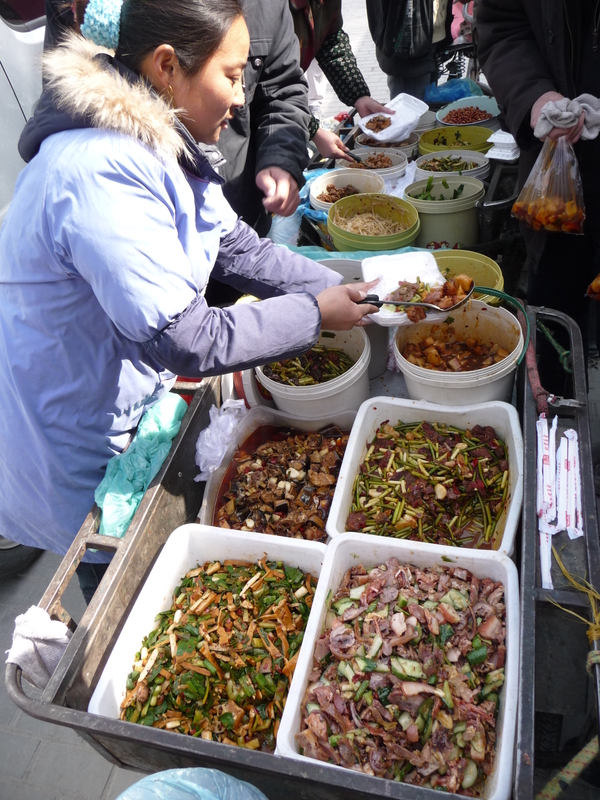 I did notice many of the kitchen opperators appeared to be Uyghurs or Hui and many dishes reflected this. I would recomend any traveler to try out this kind of food if they find themselves near an accessible building camp site. My wife and I also find the simple ways of Chinese eating with more grain products and vegetables and less meat very satisfying and we also avoid too much seafood. Two or three times a month is OK.
As for MSG, I do use it to cook with but only very tiny amounts. It is like a powerful drug and easily overused or abused. I only use the same quantity the size of 2 or 3 Sichuan peppercorns at the most. Using these quantities give the right amount of enhancement without overkill. I have observed a Chinese cook at a restaurant where they over use it and he picked it up out of it’s bowl with a wet ladle. The consequence was that too much stuck to the ladle when he stired it in.